Blenko Glass Company is made up of many unnamed craftsmen, some of whom have been with Blenko for more than 20 years. Many are 2nd and 3rd generation BLENKO employees. Blenko Glass is truly a Family Company. The employees(former and current) who spoke with THE BLENKO PROJECT spoke often of this 'feeling of family' at BLENKO. 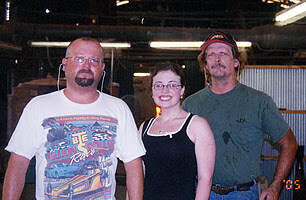 Below are some pictures of our founder Dr Hillary Homburg with some of the BLENKO glass workers. Ray Adkins putting air into the ball. Kieth Morris blowing the ball. Keith Morris blowing to the mold.